Ane-Katrine von Bülow and Iben Kielberg show new work at this flowering exhibition of ceramics and glass. It focuses on the happy colours and patterns. They were both educated at Denmarks Designschool in Copenhagen and from different paths have come together for this exhibition in Copenhagen. Iben Kielberg loves colours and patterns. 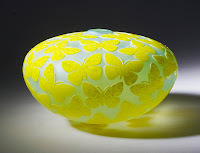 She masters the combination of the warm lively glass and sand blast decorations on the surface. The motives often come from nature and can be anything from beetles to butterflies.